Soft yellow and pink colors decorate the sky over the town of Perce and the famous landmark of Perce Rock in the Gaspesie Peninsula in Quebec, Canada at sunset. Thin puffs of clouds are highlighted across the sunset sky which slowly break up as the soft yellow lighting spans the horizon. The town of Perce is a small coastal community at the tip of the Gaspesie Peninsula where people once relied on fishing as a source of income. Tourism has become the town's first interest as thousands come here each year to see the natural beauty of Perce Rock. When the tide is at its lowest, people can walk along the shoreline from the town of Perce out to Bonaventure Island and Perce Rock, a piece of history dating back 375 million years. The limestone stack is 1,420 feet long, 296 feet wide and 289 feet high making it one of the largest and most fascinating natural arches throughout the world. Picture of the soft colors blanketing the sky at sunset over the town of Perce and Perce Rock in the Gaspesie Peninsula, Quebec. 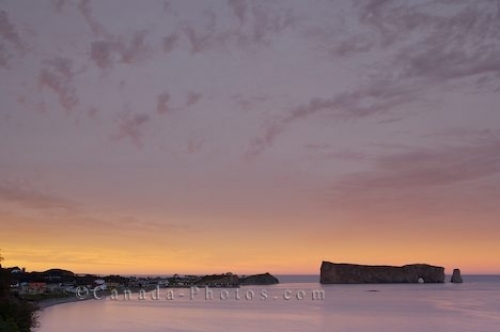 A very calm night with soft colors surrounding the area at sunset as the town and Perce Rock prominently stand out, create the perfect setting and paradise for photographers.